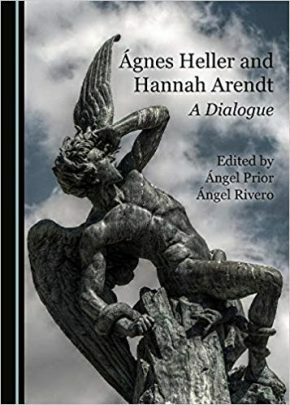 Se invita a la presentación del libro colectivo Ágnes Heller and Hannah Arendt: A Dialogue, Newcastle upon Tyne, UK, Cambridge Scholars (2018), co-editado por Ángel Prior y Ángel Rivero. Participan como co-autores Ágnes Heller, Patricio Peñalver, Antonio Campillo, Fina Birulés, Antonio Rivera García, Neus Campillo, María Pía Lara, José Luis Villacañas, Cristina Sánchez, María José Guerra Palmero, Ángel Prior Olmos, Wolfgang Heuer, Andrea Vestrucci. – Antonio Campillo, Universidad de Murcia, coautor. – Ángel Prior Olmos, Universidad de Murcia, coeditor y coautor. – Francisca Pérez Carreño, decana de la Facultad de Filosofía de la Universidad de Murcia. Lugar: Salón de Actos del edificio Rector Sabater, Ronda de Levante, nº 10, Murcia. Día y hora: miércoles 28 de noviembre, a las 19 horas. This book reconstructs, through texts by Agnes Heller and international scholars, a timely conversation between Hannah Arendt and Heller on the malaises of modernity. This valuable work will be appreciated both by academics and students interested in social and political philosophy, in addition to the wider public curious of intellectual history. Both Arendt and Heller are great thinkers with the ability to enlighten the great moral and political problems of our time. Although these two great figures belong to different generations, the dialogue reconstructed here provides a fuller picture of the demise of the great totalitarian forces of the twentieth century. Both Arendt and Heller, in a sense, accepted the burden of understanding the evils of their age. It is, however, Heller, by addressing the perennial problems of modernity posed by Arendt, who makes this conversation possible, illuminating the problems of this century.